There is still chance of miscarriage after you've see a heartbeat. However, even women that are at a high risk for a miscarriage can work with their doctor for a healthy pregnancy. Miscarriage is a natural loss of pregnancy that occurs before you enter your 20th week of pregnancy. Approximately 80 percent of all miscarriages occur before the mother enters her second trimester. About 50-70 percent of these miscarriages occur without the mother realizing she was pregnant in the first place. 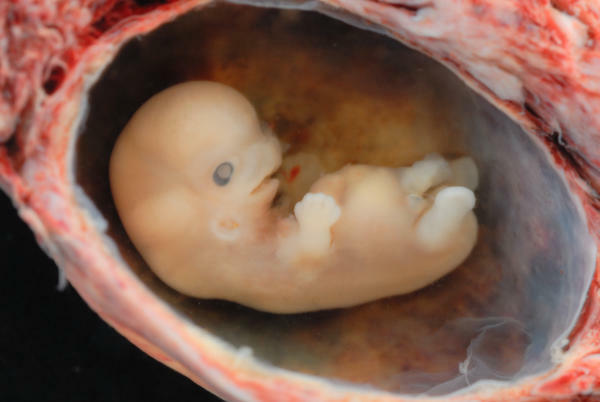 Most of these early miscarriages occur because there was a chromosomal abnormality in the growing fetus that would not allow it to grow properly. What Are the Odds of Miscarrying after Seeing Baby's Heartbeat? Generally it is believed that the chances of miscarriage after seeing heartbeat on an ultrasound are greatly reduced. The fetal heartbeat can be heard on an ultrasound test as early as five weeks into the pregnancy. The heart will not be fully developed at this point, but the existing myocardial muscles have begun to contract. Contractions beyond 120 beats per minute are considered normal. Once this landmark is reached, the risk of miscarriage drops to approximately 5 percent, so long as no other complications are present and there are no signs of vaginal bleeding. Hearing a strong, healthy heartbeat on your ultrasound is also essential to dropping your risk of miscarriages. Those experiencing vaginal bleeding have about a 16 percent chance of experiencing a miscarriage at this stage of pregnancy, especially if the heartbeat on the ultrasound is weak or irregular. Though the chances of miscarriage after seeing heartbeat are low, several factors can play a role in a woman's likelihood of suffering a miscarriage. Age of Mother- Age is the largest contributor to the likelihood that a woman will suffer a miscarriage. Women over the age of 35 have at least a 16 percent chance of suffering a miscarriage, even after seeing the heartbeat on an ultrasound. Women over 40 have a 20 percent chance of suffering a miscarriage at this stage of their pregnancy. Women with Preexisting Medical Conditions- Those with preexisting medical conditions have a much higher chance of suffering a miscarriage. It's even higher if the woman who has a history of or current issues with substance abuse. This includes using recreational drugs, smoking or excessive consumption of alcohol. History of Recurrent Miscarriages- Those that have a history of miscarriages have a 17 percent higher chance of having a miscarriage after seeing the heartbeat on your ultrasound. This statistics are even higher if the woman is over 30 years old, even if the woman is quite healthy. When a woman learns that her chances of miscarriage after seeing heartbeat are higher than others, it can be very unnerving. However, it is important to note that every woman's body is different as is every pregnancy. Unless there are clear signs that something is going wrong or you are having trouble conceiving there is no reason to worry about your chances of suffering a pregnancy. Due to the methods of calculating gestational age from the last day of the previous period rather than from the date of conception, it can be difficult to determine the proper age of the fetus. Because of this you may not be able to detect a heartbeat at your five week ultrasound. If you ovulated late, this simply means that the baby is not old enough to produce an audible heartbeat, which is no reason to believe that you are at risk for suffering a miscarriage. In most cases, a woman will be able to detect a healthy heartbeat a week or two later at her next ultrasound. It is not uncommon to hear the first heartbeat as late as 10 weeks of gestational age if the baby is growing very slowly. Blood tests can also be used to determine if you are experiencing a healthy pregnancy. These can be performed to check hCG levels, which should rise throughout your pregnancy. If they are not rising at the right levels, this can be a sign that the baby has stopped growing. This can be a serious sign that you are at high risk for suffering a miscarriage. Your doctor may determine that a D&C (dilation and curettage) is necessary at this stage to protect the mother's overall health.